Company culture, is and always has been the key driver of differentiation between companies. A positive company culture defines the gaps between average performers and high performer companies within any sector of business. Company culture demonstrates its true personality, is the environment in which employees exist. Culture is what differentiates brands within sectors. 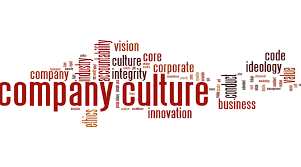 It is culture which employees buy-in too, from first engagement through to life-time employability, culture matters from cradle to grave in loyalty in employing people and in creating loyalty with customers. Company culture is the only real differentiation between leading brands in maturing market sectors. Company culture is not a single element but includes the entire working environment, established, maintained and driven by its leadership. Culture within the workplace is today the biggest differentiator between organizations. The whole working environment, creating and developing a successful company working culture, is today at the heart of leadership goals for companies who want to stand out within their sector. Behind the concept of cultural differentiation is the assumption that the culture is inexorably linked to behaviours within a brand that define the results the customer (and employee) will experience. What makes a company culture work within a company? Is a cohesive set of beliefs embodied within a set of living values. That life comes from and is sustained at the top of the organization, its leadership. What they do matters if they believe it matters. The leadership team must all do it together and consistently and measure themselves and others by it. From remembering first names, to saying good morning, to what you wear and how you behave, culture matters most at the top. I’ve put together a simple set of key elements, 8 in total which I think you can measure a company culture by. So here is how I think you can and underneath see how I would suggest you measure your company culture, and how to develop the culture you want to achieve. How to assess your company’s culture. Where and why does your company excel at what it does without having to stretch itself? Businesses like people develop areas of expertise in which become good at through consistency and develop into a cultural competence in undertaking. These core competencies become areas, which organizations culturally outcompete others within the sector. Like an Olympic athlete, you see them perform at the top level, only because they have worked hard (with real raw talent as a start point) to get themselves there. The basics of what they do, the discipline to get up at 4am every day for years so that they can run heats and make the finals and still be able to excel is all because they have the core competency to get that far. The same is true in companies; great companies have their culture built upon core competencies, which they can rely upon to put them where they need to be to perform when they need to at the highest level. Core competencies, areas where organizations operate more efficiency and effectively than their competitors are central to their success. They provide an internal strength, a natural or developed competitive advantage within their market and an ability to excel in certain operations or activities. Successful companies find and develop their place within a market sector. It takes careful strategic positioning of the brand to develop a coherent competitive position within a market. Successful brands make that position identifiable and defendable, and so they can sustain it for the long term. That ability to consistently defend a desirable position within a market is core part of a successful company’s culture. A competitive position within a market creates a style in how they own that space within that market is a vital element in making any brand a sustainable success. How a business competes is a cultural approach from the top of an organization. As a business matures it can develop a competitive position, through consistency, within a market, which company’s can create as part of its cultural approach to how they defend their market position. What can a company do, what is its capability to do something new, innovative or different? A company’s capability reflects not just how stretched an organization is in delivering its standard operations but more importantly upon its capability to do more than just survive. A company’s cultural capability is the ability for a company to invest in developing itself and its people for long-term success. Companies feel their capability in how they look at challenges and opportunities. Companies with a confident cultural approach, a positive attitude to situations, allows employees to take risks and learn form them. Employees feel comfortable suggesting ideas, trying things and in expressing their views in a hierarchy free environment. If a company feels capable it reduces and then removes traditional command and control mechanisms, replacing them with a freedom to operate culture. That culture develops its talent faster than its competitors and develops talent identification, acquisition, development and retention as a clear cultural strategy. A culture of collaboration, working with channel partners, both upstream (supply chain) and downstream (strategic customers) is a cultural approach within a market. How companies collaborate, where, when and with whom, provides a competitive culture. It allows both small and larger companies to leverage their size within a market. Using supply chains to develop innovative products, up-streaming product sourcing, or working with specialist outsourced manufacturing; working with people in ‘open collaboration systems’ creates a cultural competitive advantage. 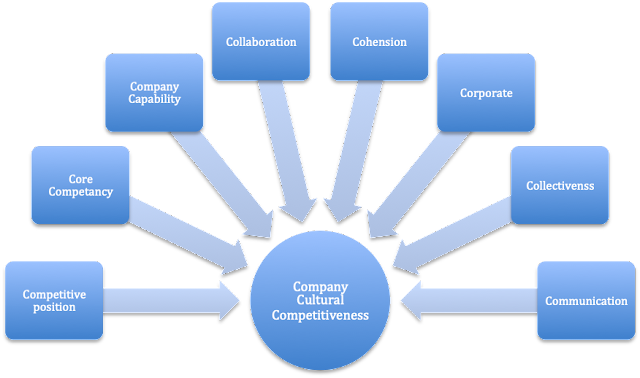 A competitive culture using collaboration multiplies the competitiveness of a company within its market. Those companies that collaborate successfully outcompete their market competitors through both upstream early adopter acceleration and down stream channel control. Organizations which operate in silos, have cost effective units but sacrifice cohesion between the departments. The strength of silos is in internal department strength, but that cost effectives creates counteracting two factors. Firstly in how silo’s operate, differing departments develop at different paces, stretching organizations between strong and weak departments. Secondly interdepartmental work suffers; the ‘them and us’ culture creates poor morale and lower trust between departments. The lack of collaboration between department’s lowers productivity, implementation and innovation, it results in low internal cohesion. Companies where cohesion is high, allow people to move across departments, encourage joint project working and develop people’s talents and encourage synergies that produce a cohesive organization. How the leadership pulls together is another important element in competitive culture development. How the leadership pulls together, with a clear strategy for the business in place with full stakeholder engagement creates a collectiveness, which everyone pulls together around. Ensuring all shareholders and stakeholders are fully onboard, meeting their precise short and long term objectives and goals is an important element in competitive companies. When all parties are pulling together organizations can drive forward without having to carry alternative opinions. The less time the executive team must spend on ‘managing’ or directly fighting with other people’s objectives the more time they can spend their time focusing on their corporate strategy. The second challenge that corporate collectiveness identifies is that with stakeholder engagement the leadership can leverage from its stakeholders. Stakeholders, rather than just being the shareholders and influencers can also directly contribute to its success. Bringing in new skills, contacts and support. Probably the most apparent identificator of culture is how an organization conducts its communication. Good communication inside, throughout and beyond is a sign of a positive culture within an organization. The change from ‘knowledge is power’, the closed, controlling top-down, need-to-know to one of open multichannel dialogues is the most significant cultural shift within companies today. Poor cultures such these are typified by the as email everything all the time, and the endless meetings to endure, both reflect the ‘tell them what I need them to know’. Poor communication cultures often include heavy formal reporting of every activity, numerous KPI’s and other activity measurements, creating a police like state within the organization. Companies with this type of culture rely upon formal multiplatform reporting from CRM, weekly reports, pipeline reports, and monthly plan updates. Those communication styles create controls and formality, reducing trust and creating distance between leadership and their teams. Micromanagement exists at every level and employees feel like they are in a sausage machine of productivity, often where the reporting takes longer than the activity. Apart from the obvious demoralization of the workforce, it also reduces creativity and reflects in people’s attitudes at work that they must undertake their role in only one way. Today’s positive cultures include multilevel communication, open mentoring, positive feedback loops at all levels resulting in engagement throughout the organization. Objectives at all levels are understood and discussed. Emails are there to summaries actions and outcomes. The use of open team software tools allow, real-time monitoring and proactive support with project oversight reporting. Informal meetings and continual mentoring, including Agile working practices all support improved communication. In companies with positive and engaging cultures, people feel empowered within their role and enjoy high-engaged awareness of wider issues within the whole business. Good communication breads holistic communication which encourages and motivates people to opening engage with the their organization rather than try to manage communication. 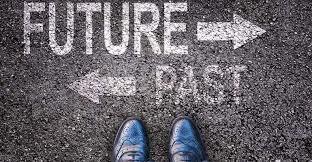 Like to talk about how to change culture, then get in touch enquiries@cowdenconsulting.com. Top class training programs for Developing Leadership Skills are focused to enhance the leadership qualities of the employees to turn them into effective leaders. No doubt,organizations can grasp benefits from the effective leadership of their employee to achieve their objectives.